Description: Ranch is America's condiment and we've made it without the salt! Creamy sweet cream buttermilk powder mixed with fresh-tasting herbs and spices to make a low sodium familiar favorite. 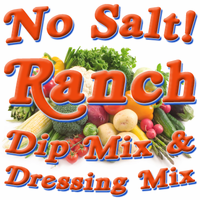 Not only can you make a rich ranch dressing or a creamy ranch dip with this mix, it also seasons potatoes, pork chops, meatballs and more! Features: No added salt, sugar, or MSG. Gluten Free. Vegetarian. Hand-crafted in small batches, from our own original recipe in Ohio. Abbreviated Ingredients (Faux Salt Option) onion, buttermilk powder, herbs & spices, garlic, salt substitute, vinegar powder. Abbreviated Ingredients (No Salt Option) onion, buttermilk powder, herbs & spices, garlic, vinegar powder. Contains milk. Packaged in a facility that handles wheat, milk, soy, egg, peanuts, and tree nuts.